The Israel Postal Company made a special delivery on Tuesday. 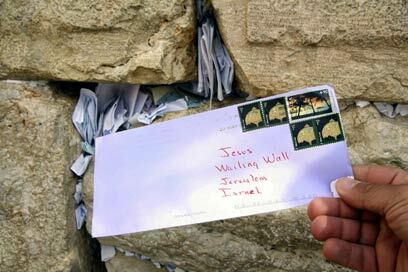 In a festive ceremony held at the Western Wall, thousands of letters to God sent in from people from all over the world were placed between the ancient stones of the wall. Director-General of the Postal Company Avi Hochman was in charge of the important delivery, along with the Western Wall's Rabbi Shmuel Rabinowitz, who prayed for the senders and asked that their prayers be answered. The Postal Company said that during the year all letters that are addressed to God are compiled in one package, and once a year a ceremony is held in which the letters are placed in the wall. 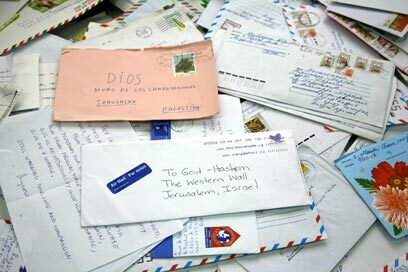 Before the letters are delivered, each envelope is opened and some of the letters are even read in order to save space, as some of the letters are actually addressed to the post's director-general asking him to get a message across to God. In 2008 a significant rise in the number of letters sent to God was noted, which the Postal Company could not explain. Twice a year, ahead of Rosh Hashanah and Passover, Western Wall employees clean out the wall from all the notes and letters and bury them in sealed bags on the Mount of Olives. See all talkbacks "Dear God"